“The only one of its kind in the world,” boasts the new Canadian Museum for Human Rights (CMHR) that opened its doors last year in Winnipeg, the capital of the western province of Manitoba. A landlocked city of over half a million inhabitants known for its frigid winters, Winnipeg has a long human rights legacy, from feminist and social activist Nellie McClung’s fight for women’s suffrage in the early 1900s, to the ongoing struggle for the rights of Indigenous peoples. Moreover, Manitoba was the first province in Canada to give women the vote, and it is home to the country’s largest urban Indigenous population. 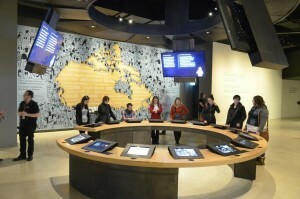 With the CMHR’s stated purpose being “to explore the subject of human rights, with special but not exclusive reference to Canada,” global women’s rights issues are an integral part of the museum’s various exhibits. Canada’s first new national museum since 1967 is located next to the Forks National Historic Site, where the Red and the Assiniboine rivers meet in downtown Winnipeg. Designed by American architect Antoine Predock, the architecturally stunning building is often compared to the iconic Guggenheim Museum Bilbao in Spain. Its soaring Tower of Hope spire and sweeping walls of windows form a new silhouette on the city’s skyline, while its grounds, planted with 15 species of prairie grass, create the largest urban installation of natural vegetation in the country. At a cost of $351 million dollars, the CMHR is a joint venture between public and private funds. It won four awards at this year’s annual meeting of the American Alliance of Museums in Atlanta for its interactive kiosks, tables, and games, along with the museum’s interactive mobile phone app—the first of its kind in the world. Visitors travel through 11 core galleries divided thematically along 800 meters of glowing ramps of Spanish alabaster—a literal path of light through the darkness. It takes about 30 minutes to walk continuously from the main entrance through all of the key human rights exhibits over seven levels that lead to the Tower’s observation deck. As visitors enter the museum, they are greeted by a wall onto which “Welcome” is projected in 36 languages, including 12 Indigenous tongues. On the floor is a bronze cast of a 750-year-old moccasin print discovered during an onsite archaeological excavation in 2008. The journey continues onto the next level with the galleries What are Human Rights, Indigenous Perspectives, and Canadian Journeys. The latter, the largest in the museum, explores dozens of Canadian-related human rights stories across a 29-meter digital screen. Two levels up, a gallery called Examining the Holocaust explores not only the Nazi-directed genocide, but also Canada’s own experiences with anti-Semitism. Accounts of women’s rights can be found in most of the galleries but they are not isolated to a single location. Stories of violation, survival, resistance, and inspiration are woven in the 11 galleries. Colonel Jeannie Carignan is one of four introductory “video people” who explain what human rights mean to them. As the first female commanding officer of a combat unit in the Canadian Armed Forces, she talks about women’s rights and equal treatment in the military. An artifact case features British suffragette sashes and badges from 1909 and 2009. A timeline includes feminist thinkers, writers, and activists like Mary Wollstonecraft, Harriet Martineau, Mirza Fatali Akhundov, Betty Friedan, Gloria Steinem, and Mary Robinson. 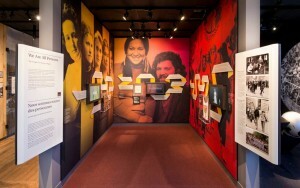 In the Protecting Rights in Canada gallery, there is an exploration of rights issues in Canada’s legal system including the 1999 Supreme Court case surrounding a female firefighter who was fired for failing newly instituted fitness standards. Another exhibit showcases the efforts of thousands of Canadian women to have gender equality rights entrenched in the 1982 Charter of Rights and Freedoms. Turning Points for Humanity has a large interactive exhibit with videos about women’s right to drive cars in Saudi Arabia and the “Bell Bajao” campaign against domestic violence. There is also a photo exhibit called Actions Count, designed to counter prejudice against Muslim women who wear the hijab (veil). An interactive table game includes a scenario where players attempt to organize events that build understanding about Muslim women. Rights Today is a world map that includes women’s rights as one of five illustrating themes and presents a selection of stories and issues from around the world, while Inspiring Change looks at women’s resistance to Apartheid in South Africa. One of the most striking exhibits is The REDress Project, located in the Canadian Journeys gallery, a haunting art installation by Winnipeg artist Jaime Black that consists of dresses on hangers in front of a woodland setting, intended to draw attention to the more than 1,000 Indigenous women who have been murdered in Canada. In Winnipeg in particular, the deaths and disappearances of Indigenous women and girls is a recurrent problem—like the case of Tina Fontaine, a 15-year-old whose dead body was found stuffed inside a plastic bag floating in the river behind the museum just two weeks prior to its inauguration. From the very first moment the idea of the CMHR was conceived by the late Israel Asper, a politician and media magnate, it has been plagued by controversy. Much of the criticism has come from various groups worried about the allocation of space to and descriptions of their respective causes in the museum. The Ukrainian community was concerned about the presentation of the Holodomor—a man-made famine in Ukraine in 1932 and 1933 that killed several million people—and how it would compare to depictions of the Holocaust. Legendary Canadian singer Buffy Sainte-Marie, who was at the CMHR’s opening ceremony, argued that Canada and the museum should use that term to describe the Indian Residential School (IRS) experience—a practice from the 1800s to late 1900s of removing Indigenous children from their families and placing them in boarding schools in order to assimilate them into the dominant Canadian culture. “I don’t really think that some of the museum people are truly aware of what history has been, maybe not intentionally. I think there has been so little real information about Indigenous people available that most Canadians are unaware of the genocide that really did happen here (and worldwide) as a result of entrenched European colonialism. In response to the TRC report, the CMHR will have two new exhibits this year: the carved Bentwood Box used during TRC events to receive gifts marking the personal journeys of IRS survivors; and, opening in December 2015, the Witness Blanket, an art installation made from hundreds of items reclaimed from residential schools and other sites from across Canada commemorating the atrocities of the IRS era.